The "Untamed River" is a bit tamer now. 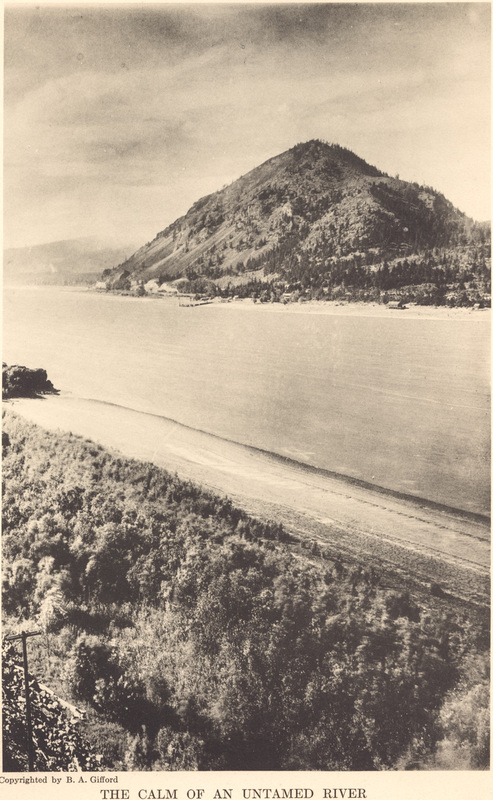 Wind Mountain still guards this bend in the Columbia, but there are a lot more roads and railroads in this view today. This Benjamin Gifford photogravure was from a 1912 book, though it could be several years earlier. I notice that there are quite a few buildings across over there, that are not there now, plus that dock running out there. See the old Indian head up there on the side of the mountain? The mountain where the Indians said the wind blew both directions, and sometimes I think it really does. I am surprised the dead, flooded tree stumps don't show up in this photo. I sure wish we had beaches like that today. With all that blowing sand? Just to the right of Wind Mtn. is Collins Point. I don't know if the buildings we can see are considered part of Collins point. There was a boat landing, with a flume coming down Collins Creek, carrying fuel for the steamships, a hotel, a hot springs, and a hospital. When driving Hwy 14 through the area of Grant Lake and Collins Point, all the trees are leaning toward the River. Ten or twenty years ago, there was a problem with the land sliding in this area, but the sliding has slowed down. Certainly an interesting area of geology.